We’re getting closer and closer to the day when our phones can replace our desktop PCs – the average Android phone now has a quad-core CPU, 2Gb or more of memory, and solid-state storage, all of which are close to, or better than, the specs of a cheap 2-year old PC. With that in mind, is there a way to actually use all that power productively? Read on to find out…. I ran across a booth at Computex recently that was promoting MHL and Andromium as a way to use your Android phone or tablet as a desktop replacement. 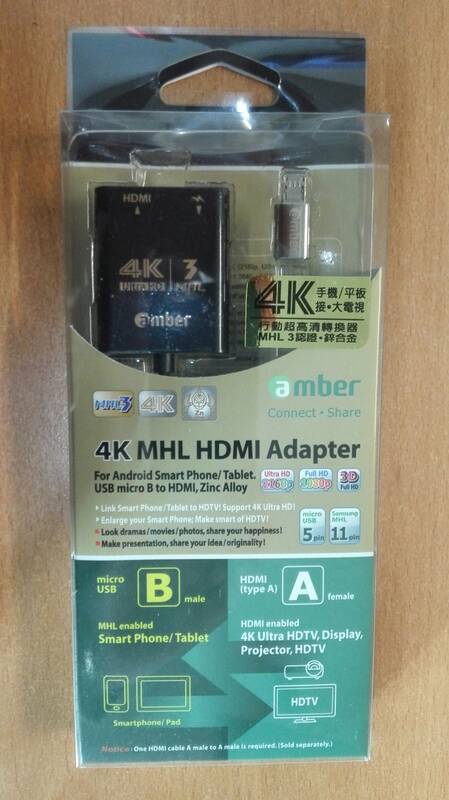 If you pair a Bluetooth Keyboard and Mouse with your Android phone or tablet, the Andromium app gives you a Windows-like desktop metaphor, so all you need is an adapter to get the phone’s video and audio to your screen, which brings me to today’s review – the Amber MHL-008H MHL 3.0 Android to HDMI TV Adapter. 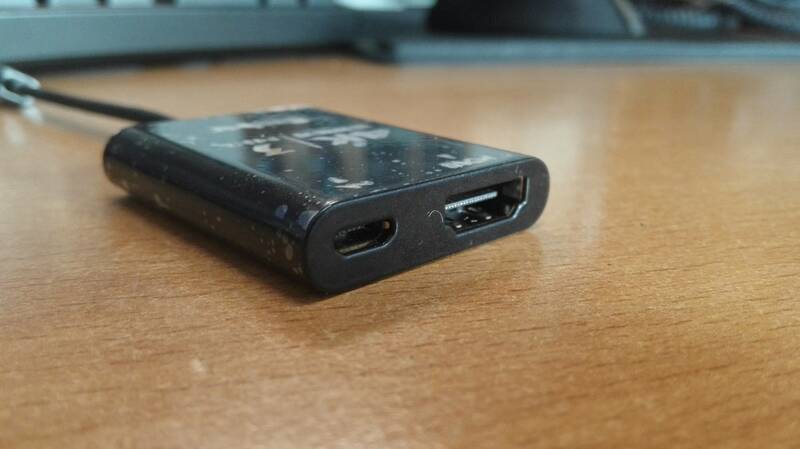 This dongle plugs into the Micro-USB plug on your Android, and has a standard HDMI socket (below, on the right) that you can use to connect your TV or monitor’s HDMI cable, in addition to a charging socket for your MicroUSB charger (below, on the left). This one is made out of a fairly weighty metal, and comes in a see-through package that would easily post in a 500G Express Bag. 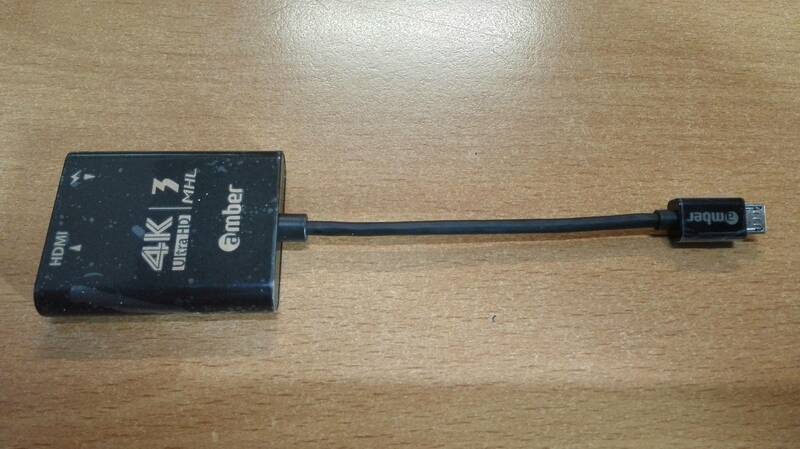 The manufacturer is Taiwanese, but has no current website – they are otherwise a manufacturer of better-than-average cables. Due to the various standards adopted by MHL over the years, there’s been some different pinouts used by manufacturers like Samsung, with the result that you might need to use the included silver converter plug when you have a Samsung phone. Other brands of phones tend to work natively out-of-the-box (I’ve successfully used it with Sony’s Xperia Z-series and Huawei Mate 7 that way). 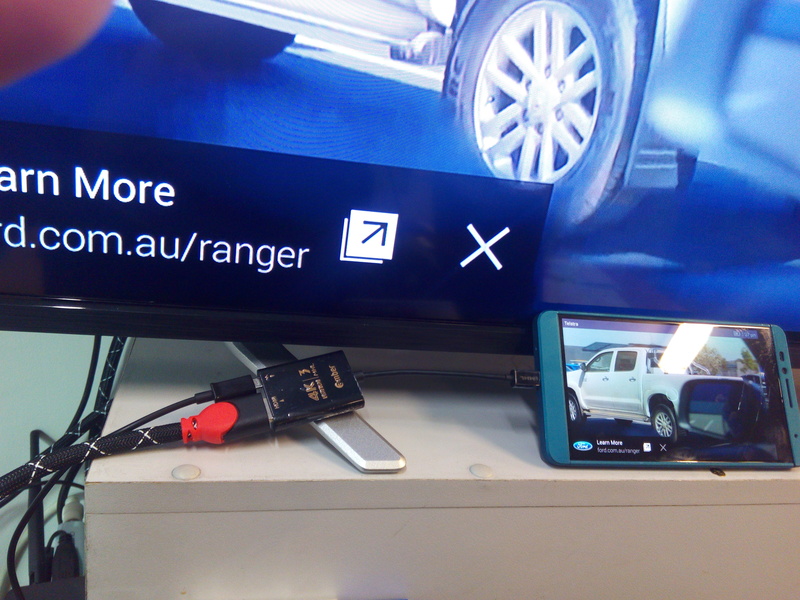 Plug your display’s HDMI cable into the Amber MHL adapter, connect the MicroUSB to your Android, and you’ll see the Android’s screen on your display immediately – no drivers to install, nothing to configure. If nothing happens, it’s likely that your phone maker didn’t give your Android MHL compatability – a random Chinadroid (Ulefone Be Pro) I tried with it didn’t work at all. There’s a partial compatability listing here. There’s nothing to configure on the Android, and the display will be given whatever resolution the Android’s display supports – my Huawei Mate7 and Sony Xperia both output 1080P resolutions, which appear on the connected TV without any over/under-scan issues. 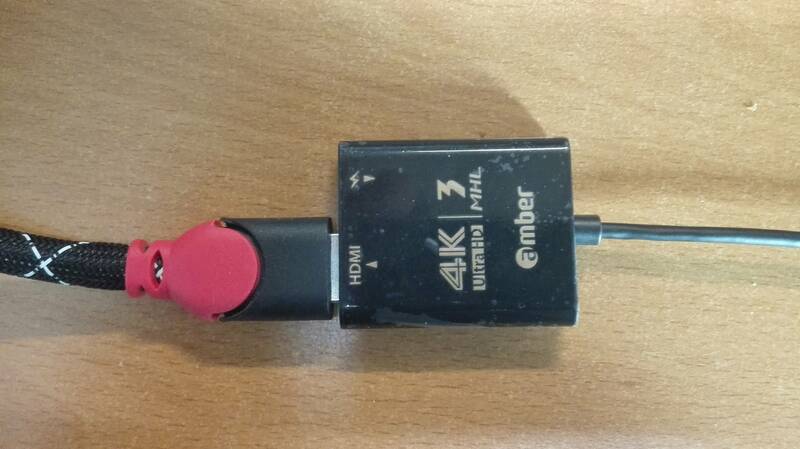 This adapter claims support for 4K 2160P (4096×2160) quality, and is backward-compatible with 1080P (1980×1020). Your Android’s screen will probably have a auto-rotation feature, so you will need to orient the phone to match your TV. This particular MHL adapter is built to the MHL 3.0 standard, which now supports 4K displays, and a faster MicroUSB charging rate (up to 2A), than the previous standards. I’ve yet to see a phone with 4K resolution, but 4K TVs are common enough now, so the phones will likely follow on soon enough. 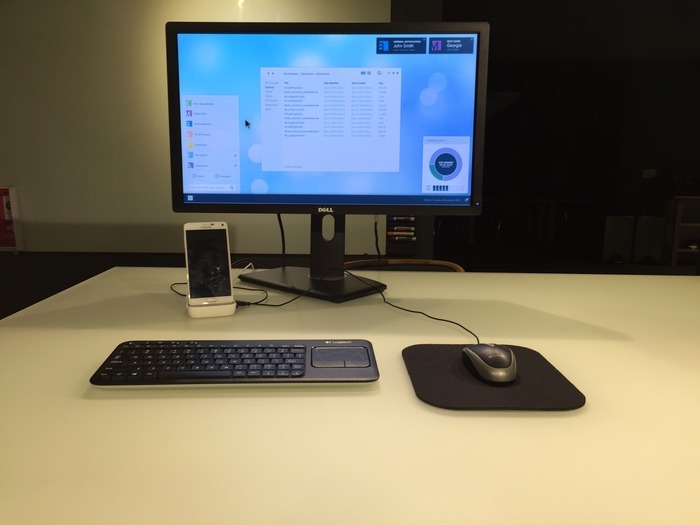 I’ve paired my phone with a Filco Convertible mechanical-switch desktop keyboard, and Microsoft Bluetooth mouse, to get the full desktop experience that Andromium offers. The Filco, which supports swapping between Bluetooth gadgets, and a USB PC, was particularly useful here, as it can swap from being a USB-connected keyboard for my PC, to being the Bluetooth keyboard for my phone, or a nearby MelePC, simply by pressing a set of function keys. 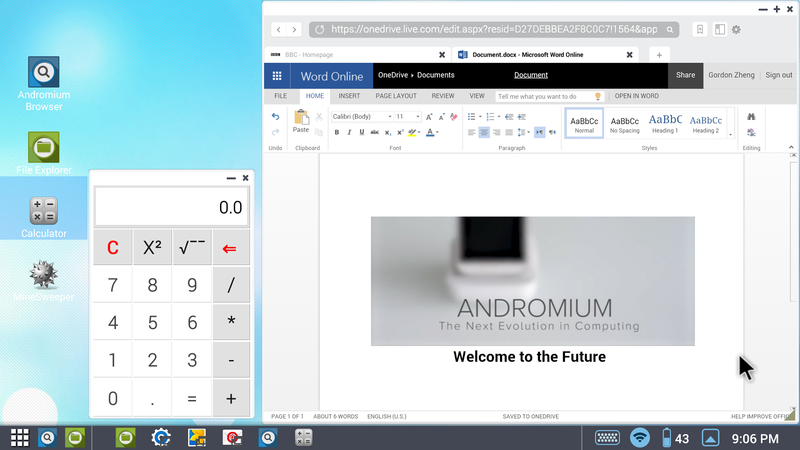 The most noticeable features of Andromium are the ability to put apps into windows for multi-tasking, so you can have multiple apps open on the same display, and a taskbar/start-button across the bottom of the display. The video below gives you some idea of how it works. It’s early days in some areas – the app tends to run in the background all the time, and killing it can be a little difficult. The desktop can’t be customised extensively as yet, and if you want to just do some basic display jobs, or presentations, it’s easy enough to use if you can pair it with a mouse – less so if you have to use a fingertip. But hey, given it’s free to download, you can’t really complain. Anything else the Amber adapter is good for? If you have a bunch of photos to show when you visit your rellies, then it’ll make itself worthwhile by letting you display them all on the loungeroom TV for everyone to see at once. This’ll save you from having to pass the phone around the room, explaining what the photos are about to each person over and over again, and it’ll also save the inevitable hassle of explaining the whole touchscreen thing to the older members of your family who are still getting to grips with their “cordless telephones”. 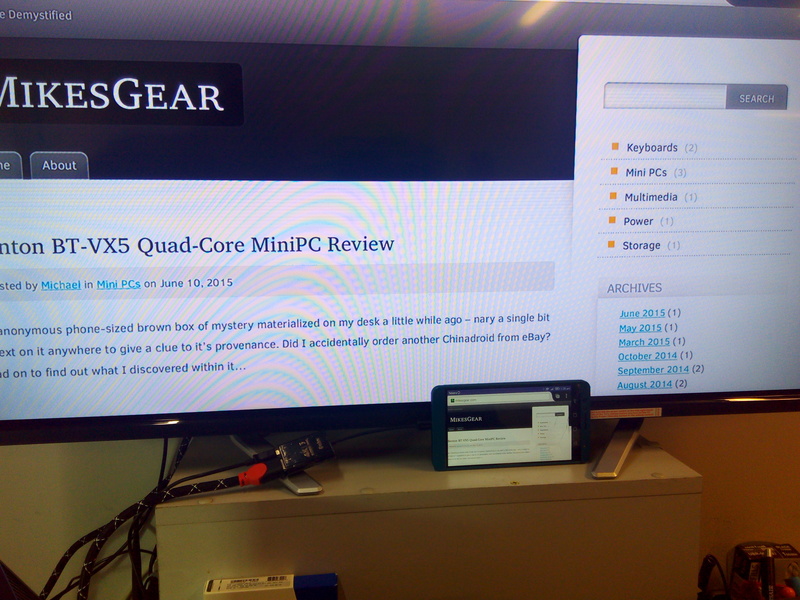 Want to stream TV or movies, or playback music from your phone on a TV? Again, this’ll let you do it on your big-screen TV with both audio and video transmitted, perfect for Youtube. Mind you, I found that the battery in my eight-core Huawei phone wasn’t able to maintain it’s full charge when streaming Youtube over Wifi, probably because these are particularly power-hungry apps. Generic versions of these MHL adapters are available overseas for USD $20-45 (AUD $30-60) plus shipping, and this particular one goes for under AUD $70 delivered here in Australia with local warranty. You’ll know if you need it. This entry was posted on July 10, 2015, 3:23 pm and is filed under Multimedia. You can follow any responses to this entry through RSS 2.0. You can leave a response, or trackback from your own site.